There’s always been something quite mesmerizing about Mexican artist Frida Kahlo. And this month, we saw the close of the V & A exhibition in London about her extraordinary life, entitled Making Her Self Up. The title alone reflects the importance she placed on constructing her own identity. Nearly seven decades before personal branding was a concept, Kahlo’s legacy demonstrates that she was a master at it. There are so many unique aspects of Kahlo’s remarkable brand that I could talk about, however I’d like to highlight a couple in particular this month. A strong theme resides at the core of her brand. A theme of resilience emerged from her tragic past. At age six, Kahlo contracted polio, leaving her one leg shorter than the other. Then, as a schoolgirl, she was involved in a bus accident where a steel rod impaled her, resulting in a number of horrific injuries that caused a lifetime of suffering. She spent three months in a full body cast and endured more than 30 surgeries throughout her life. Yet, as The Guardian’s Cartner-Morley pointed out, she went on to become the only female artist who is instantly recognizable all over the world. The Observer described the V&A exhibit as “an extraordinary testimony to suffering and spirit”. This captures a theme to Kahlo’s personal brand; a co-existence of suffering and beauty, of agony and ecstasy, of darkness and vibrance. We even find symbolism of this during her accident, when a packet of powdered gold carried by another passenger had exploded all over Kahlo upon collision. Covered in blood and gold, she laid there hemorrhaging and shimmering among the wreckage. 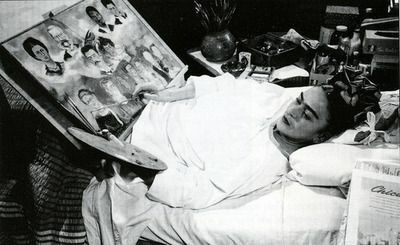 Kahlo painted in bed while recovering. After several months recovering in hospital, she returned to her family home to continue her recovery; it was here where she started painting, including one of her first self-portraits. Kahlo spent a lot of time alone recovering from operations and apparently had a mirror fitted above her bed so she could spend time with herself. Perhaps this was where the importance of exploring her identity and constructing her image stemmed from. Many of her paintings are self-portraits – 55, to be exact – many expressing two different versions of herself. These deeply personal self-portraits often convey her suffering, but also capture her inner-strength and resilience. She wasn’t afraid to cast a light on the darker corners of her life, and her experiences of pain and suffering became a central part of her brand. The Two Fridas (Las dos Fridas), 1939, the first large-scale work done by Kahlo, is considered one of her most notable paintings. The work was painted after her separation from Diego Rivera and reflects two different personalities. 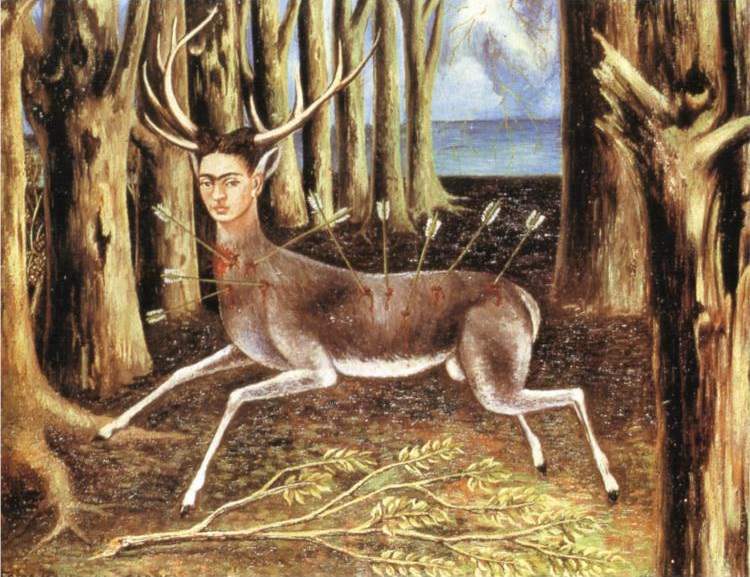 The Wounded Deer (1946) painted after a failed spinal operation earlier that year. She had an innate understanding of the power of image. Kahlo knew the power of image from an early age. As a teenager, she posed for a family portrait in full male attire: a three-piece tweed suit, complete with shirt and tie. Here she seems to have used cross-dressing as a way to express power and independence. Kahlo in a family portrait, 1926. One of Kahlo’s traditional outfits on display at the V & A exhibition. This form of expression continued throughout her life, as she turned to her wardrobe as a means to experiment with perception, and how she would define herself as a woman and an artist. She spent hours in front of the mirror experimenting with looks, and loved to shop for colourful garments and accessories. As a result of her childhood polio, Kahlo’s left leg was thinner and shorter than her right, for which she wore a prosthetic. The regional Mexican clothing she wore, such as the long, colourful Tehuana style skirts that became a defining feature of her outer-brand, also concealed the physical trauma of her past. Given her immaculately curated outer-branding, Kahlo seemed to reserve the expression of her physical pain for her paintings. Kahlo’s most distinctive feature of course is her unibrow. Her brow is as much a part of the Kahlo brand as the swoosh is to the Nike brand. It has come to symbolize a confident expression of unconventionality, described as shorthand for: “I won’t curb my self-expression to meet your expectations of how a woman should look.” It is a big part of what has shaped the image of Kahlo as an enduring feminist icon. Since her death in 1954, Kahlo’s image has been used in a wide array of consumer products, from tequila to throw pillows, and recently, even a Barbie doll. In personal branding, a Barbie doll created in your image is considered a crowning achievement. However, when Mattel revealed its Frida Barbie as part of its “Inspiring Women“collection this year, the doll wasn’t necessarily well received; critics claimed that Mattel’s minimization of her unibrow and absence of facial hair was a devaluation of the meaning attached to how Kahlo presented herself in life and art. The eyebrow pencil Kahlo used to accentuate her facial hair was even included in the V&A exhibition; a reminder that even back in the 1940s, Kahlo was challenging beauty norms in a way that still feels progressive today. 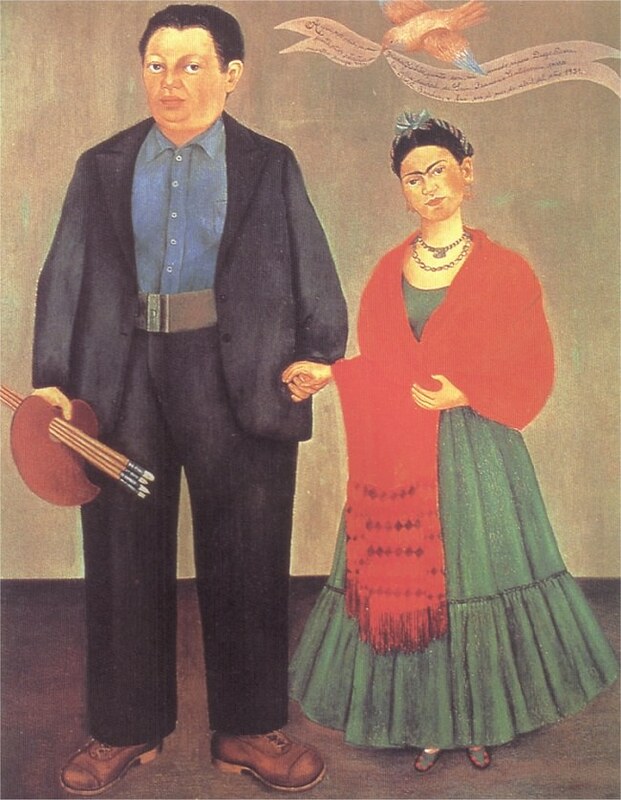 Kahlo’s Frieda and Diego Rivera, 1931, was painted a wedding portrait. Kahlo had many lovers of both sexes over the years, including well know names like Josephine Baker, Georgia O’Keeffe and Leon Trotsky, yet her relationship with Diego Rivera, to whom she was married twice (yes twice! ), has become known as one of the most vibrant and tumultuous love stories that exists between two legendary artists. Rivera and Kahlo did not have a traditional marriage and each of them had affairs. In addition to sharing a passion for art, communism was a very strong part of their life, a cause they both incorporated into their art. Rivera’s name overshadowed Kahlo’s during their lifetime, however Kahlo has gone on to eclipse him since her death. A strong personal brand endures the test of time. Given the extraordinary brand she constructed for herself, Frida Kahlo is sure to live on, inspiring generations to come. Great article! Thanks. The Brooklyn Art Museum is have a Very Large Frida exhibit next year. I wonder if it is the same one as the London exhibit. Thanks so much for the comment Sean, glad you enjoyed it. 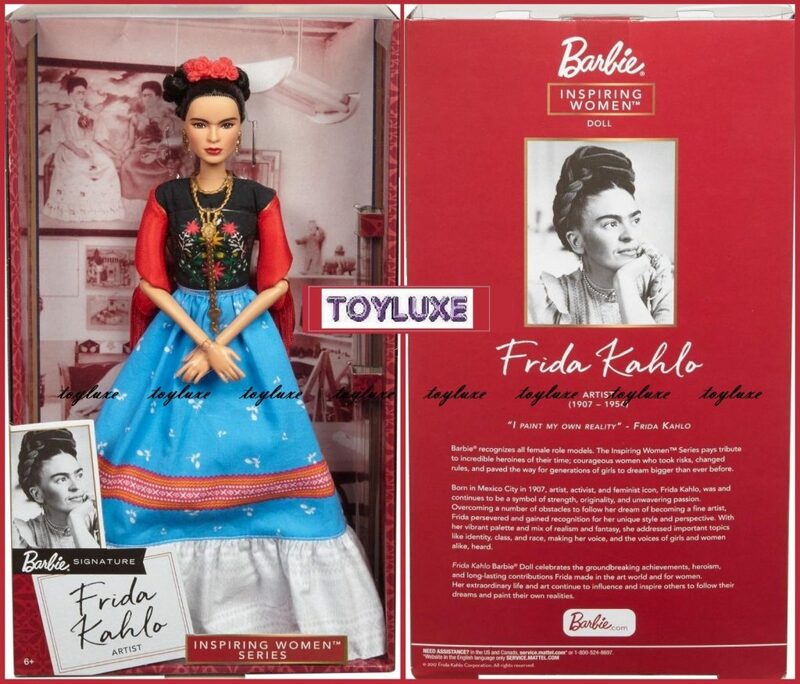 I think the Barbie Frida would be a great gift, as long as you pen in her unibrow!